Are you ready to take your advocacy to the next level, to make an even more powerful impact for kids around the world? Here’s where you should start: Join our Volunteer Advocate Community. Together with World Vision staff, Volunteer Advocates build relationships with their members of Congress, so that more children can break free from poverty and experience fullness of life. Volunteer Advocate Handbook. When you join our community, we’ll send you a Welcome Kit with a handbook to orient you to the basics of World Vision’s mission and why faith-rooted, relational advocacy is a vital and valuable way to create sustainable change for children in poverty around the world. In-depth, monthly training. At the beginning of the month, we’ll send a training email to help you develop influence with your members of Congress. Designed to be flexible for your schedule, trainings will cover everything from how a bill becomes a law to approaches for faith-rooted advocacy. We’ll also include steps for how to advocate that month! Access to an exclusive online resource hub. On our website just for Volunteer Advocates, you’ll find insider updates on our legislative priorities, access to all our new tools and trainings, and ways to connect with advocates across the U.S.
Support from World Vision staff and fellow Volunteer Advocates. You are not in this alone – share your challenges or inspiration with others on the Volunteer Advocate Facebook Group. Pray and request prayer for yourself, your advocacy efforts, and your members of Congress. (You can even take a more active role and join our Prayer !) You’ll also receive one-on-one coaching and support from World Vision staff. God has already equipped you to make a big difference in the lives of children through advocacy, but our Volunteer Advocate Community can provide you with some extra skills, confidence, and support! We need you on our team! Learn more about becoming a Volunteer Advocate by signing up below! 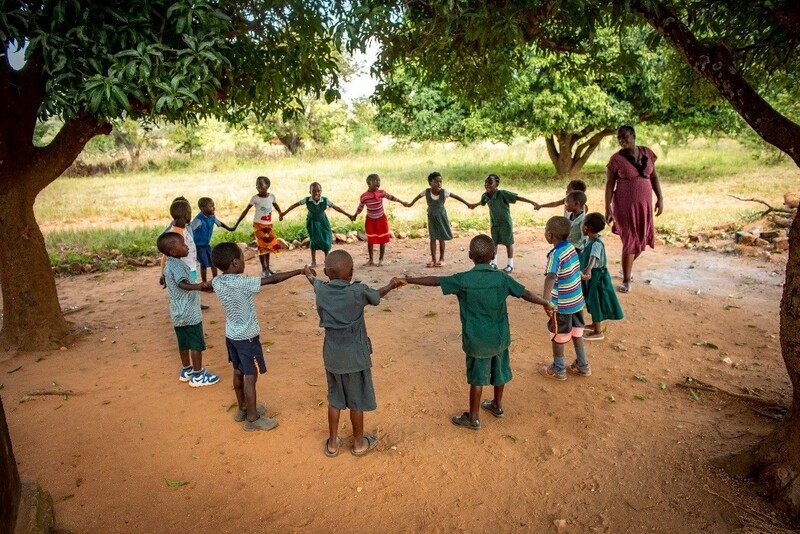 Photo: A teacher at Moyo Primary School in southern Zambia leads children in a game outside under the shade of two trees. This information on advocacy is good. I have been doing some project with a friend of mine on social transformation and found your information useful. Could you please provide me with the handbook or resources on advocacy? Do you have advocacy trainings for individuals outside US because i am in Kenya. You can reach me anytime. Hi Dickson! Thank you for your kind comment, and we’re glad you’re interested in advocacy! Thank you so much for wanting to be involved in advocacy for people in Kenya!